I don't mind telling you that I'm a little bit bummed out today...I'm bummed because lovely Kristin from one9designs is hosting a fab Giveaway today for Serenity Now readers and I can't enter because that would be just plain tacky. I introduced you to this super-cute Etsy shop last month, and I was so excited to show off some of Kristin's hand-crafted, hand-stamped creations. I think one of the coolest things about one9designs is that the shop doesn't only showcase necklaces, charms, and rings, but also really neat personalized gifts and items for pet lovers! 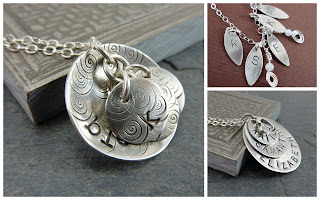 one9designs is graciously giving away a $50 Gift Certificate to the shop to one lucky reader. If you win, you can choose any personalized piece you'd like. Think Christmas (yes, I know it's June), birthdays, or even a little gifty for yourself. 1. (Mandatory to enter!) Visit one9designs, check out Kristin's fabulous work, and leave me a comment here telling me which piece is your favorite. 2. Sign up to Follow me here at Serenity Now or let me know if you're already a Follower. 3. Tweet OR Facebook this Giveaway with a link to this post. 4. Mention this Giveaway on your blog with a link to this post. The Giveaway will remain open until Sunday night at 5 pm (ET). Good luck! The Hand Stamped Mother's Pendant with Hearts is just too sweet! I love that one! I would take any of the personalized mother's stuff. Love it all! I love the teen necklace with the tennis racket. 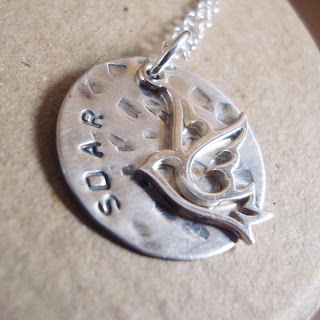 I love the SOAR necklace. I'm a bird fanatic! Thank you for the chance to win such a great gift! I tweeted and facebooked the link! I looked at all of her items up close and went back and forth many times. They are so beautiful and unique! I settled on the one above as my fave, but it was a hard choice and I imagine when I go back it will change again! I can't decide between the silver stacking rings and the Live Love Laugh necklace. Thanks for the chance to win (and sorry you're not eligible)! I am lovin' the live-laugh-love necklace! Thanks for the chance to win. I posted a link on my fb page. Handstamped Mother or Grandmother necklace with heart and bar. So beautiful!! 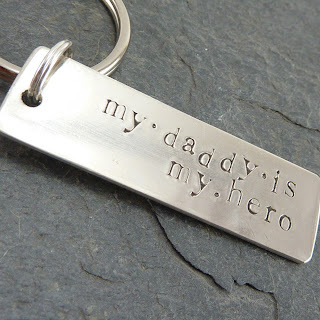 The hand stamped personalized keychain. My Mama loves anything that has my brother's and my name on it. Now that we're both married and she loves her new daughter and son-in-law she would love this with all of our names. Thanks for having such a great blog and a sweet giveaway! Great giveaway! I like the mother's necklace with swirls. Soar and the Hand Stamped Mother's necklace are to die for! As much as I love all the mother's necklaces, I think I'd have to get the double disk pet owner's necklace for my MIL. Hand Stamped Personalized Rectangle Family Necklace is my fav but I love the stackable rings too! Once again, you've written a great post for one of your lucky sponsors. This is such a generous giveaway! What a lucky winner there will be!! Love, love, love the Mother's Necklace with the heart and bar! I'm not a jewelry girl but I love these designs! It's so hard to choose but I think I like the My Loves with the heart initials necklace best. 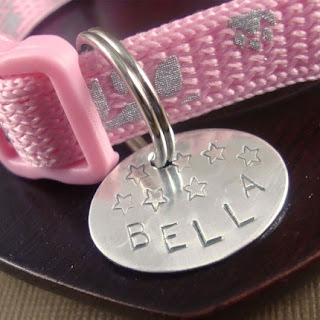 My BFF just got a third dog named Bella - the only girl - so that dog tag is tempting as well! I'm a follower - in a big way!!! And I tweeted - woo hoo!!! So pretty! I love the Hand Stamped Personalized Circle Necklace with Genuine Gemstones! I reallllly love the two disc mother necklace...just so sweet. I am a faithful follower!!! I love her rings, they are just as cool as her necklaces! What a cute shop! I love the Soar necklace and also the heart and bar mom necklace. I love the Hand stamped circle necklace with a genuine gemstone. Too precious! I follow you with Google! i have to choose just one??? omw, okay the little ones necklace and also the blue earth ring. LOVE!! I like the soar necklace. My favorite would have to be the blue earth ring. Reminds me of one I had in high school. I love everything, but I really love the mother/grandmother heart and bar necklace. I love the hand stamped gemstone necklace for moms..love it.. I am a follower, Amanda! I think the hand-stamped "mother" with the heart is my favorite!! What gorgeous things! thanks, chicka! I am, of course, a follower!!! I love all of the creations! My favorite is the Mother one. All are beautiful!